BWP scoring one of his 3 goals Sunday. @NewYorkRedBulls. Red Bulls forward Bradley Wright-Phillips was voted the Alcatel Major League Soccer Player of the Week by the North American Soccer Reporters (NASR) for the 29th week of the 2018 MLS season. Wright-Phillips earned the honor for the hat trick he had on Sunday to help the Red Bulls earn a point in a 3-3 draw against Eastern Conference rivals D.C. United on Sunday at Audi Field. It marked Wright-Phillips' fifth career MLS hat trick, which ties for second-most in league history. He now has 19 goals this season, second-most in MLS. All three Wright-Phillips goals were equalizers, and the first came in the 41st minute when the Red Bulls were down 1-0. Tim Parker headed the ball toward the six-yard area, and when the delivery wasn't cleared by D.C. goalkeeper Bill Hamid, Wright-Phillips cleaned up with a right-footed bicycle kick into the right side of the frame to level the score at 1-1 heading into halftime. BWP became just the second player in league history to record three game-tying goals in single match. Down 2-1 in the second half, Wright-Phillips notched his second goal in the 76th minute against the run of play, when Michael Murillo pushed up to cross the ball in from the right side toward the top of the 18-yard box. Wright-Phillips took a quick touch and slotted his shot inside the left post to tie things up at 2-2. 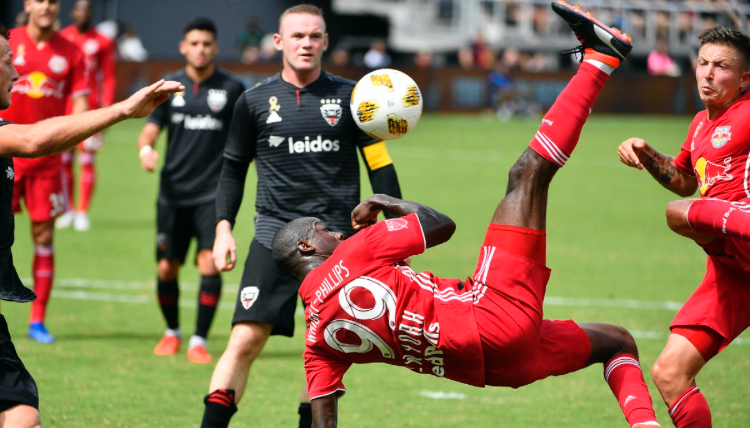 Wright-Phillips completed his hat trick with a clutch equalizer in the 90th minute, redirecting a cross from Alex Muyl from seven yards out and finding the inside of the near left post to earn a 3-3 road draw. The Red Bulls return to action this Saturday when they host defending MLS Cup champions Toronto FC at Red Bull Arena at 5 p.m.